exploration and processing sectors, in mining, the chemical industry and heavy plant construction. The complete JDN production range includes a total of 12 product lines, which are precisely adapted to their respective areas of application and requirements in terms of load-bearing capacity. Moreover, we consistently set new standards with customised solutions for exceptional applications. For over 50 years, J.D. 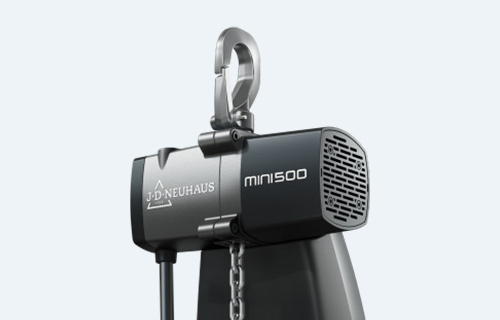 Neuhaus has been building hoists with compressed air as a drive medium and is today world-wide market leader in this technology. This proven JDN technology is also used in JDN Air Crane systems. Explosion-protected JDN Crane Systems are the right choice for the most challenging environmental conditions, whether onshore or offshore. Available in air drive or hydraulic drive versions. which can be adapted to your individual demands as complete special installations are our speciality. 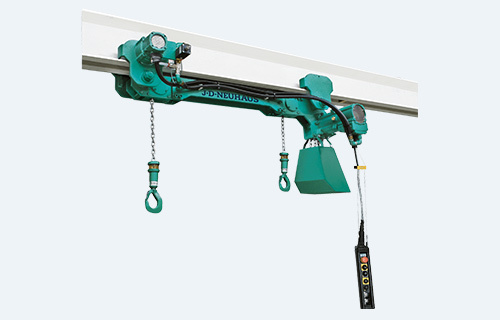 According to necessities JDN air hoists in motor trolleys or monorail systems are integrated in the crane installation. 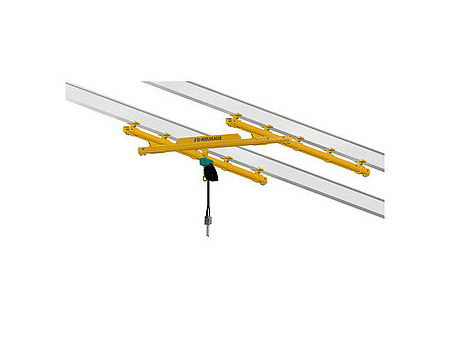 A comfortable and user-friendly pneumatic speed control is also available as for example the standard two speed control for crane and trolley drive. 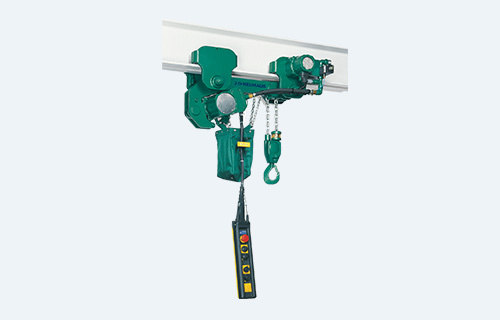 An infinitely variable speed control of the trolley and the hoist is also possible. Classification: Ex II 2 GD IIA T4(X)/II 3 GD IIB T4(X) - Higher Classifications on request. and of course the appropriate air hoist with trolley. Classification: Ex II 2 GD IIA T4(X)/II 3 GD IIB T4(X) - Higher classification on request. We have been writing hoist technology history for over 260 years and have consistently produced innovations. Today, J.D. 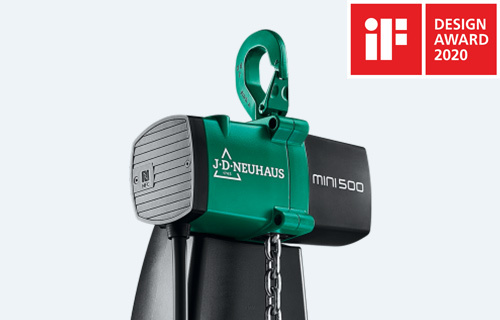 NEUHAUS is a world-wide market leader in air hoists, whether the loads to be moved are heavy or light. 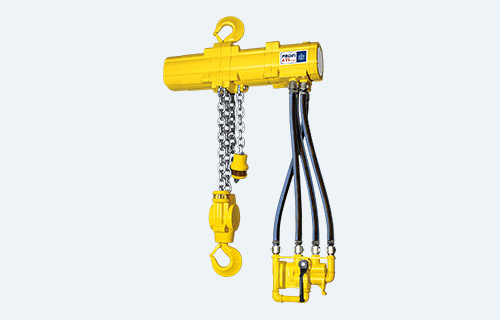 Thereby the explosion protection of our chain hoist plays a decisive role. JDN Air Hoists PROFI Series are very robust and therefore suitable for tough industrial applications even in continuous working processes. According to requirement there are various control systems. For traversing loads there are different trolleys to meet your special demands. Classification: Ex II 2 GD IIA T4(X), II 3 GD IIB T4(X) - Higher Classifications on request. 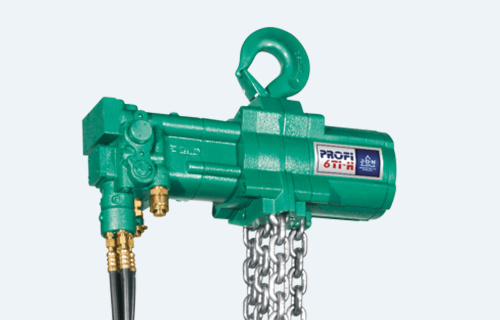 JDN Air Hoists PROFI 3 TI up to PROFI 50 TI also available as hydraulic hoists. Whereas the JDN PROFI series is recommended specially for heavy duty industrial applications the mini widens the range of application in the light duty sector as a handy, flexible and universally deployable hoist making it an ideal tool for the most different handicraft workshops. Classifications: Ex II 3 GD IIA T4(X) - Higher Classifications on request. With the Mini Manipulator loads can be lifted, lowered, manually traversed and feeded with only one hand. At the same time lifting and lowering speeds can be sensitively regulated by push button control. Due to light weight the Mini Manipulator is easy to handle. 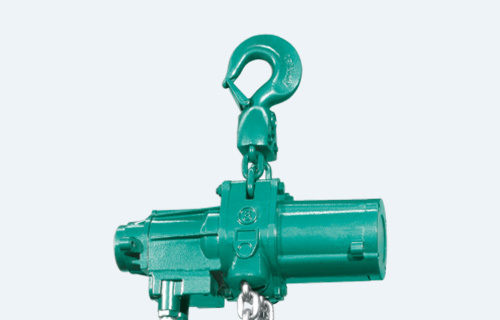 JDN Air Chain Hoists of the M series were originally developed for underground mining operations. Due to their multiple applications they are nowadays also deployed in most different industrial fields. 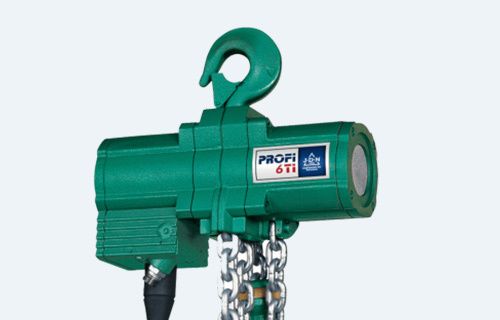 Basically they have the same features as the hoists of the PROFI series but operate with an air pressure of 4 bar only. Two different control systems are at your disposal. When only low headroom is available and the standard trolleys don't meet the requirements we recommend JDN low headroom trolleys where the air hoists are horizontally mounted.When only very low headroom is available we recommend the JDN-Ultra-Low Monorail Hoists . Classification: Ex II 2 GD IIA T4(X), Ex II 3 GD IIB T4(X) - Higher Classification on request. 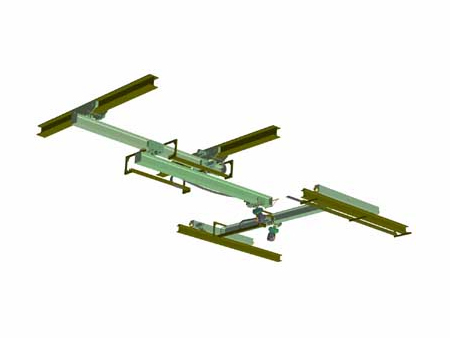 JDN Monorail Hoists are available with air or hydraulic drive for the offshore industry and where heavy loads in reduced spaces have to be moved. 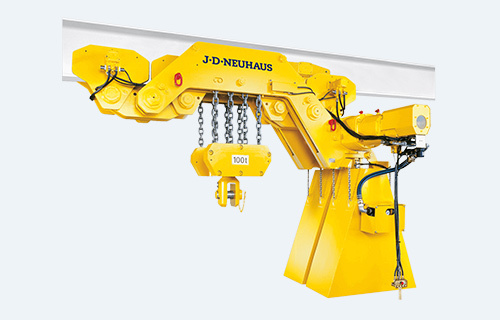 According to application JDN Monorail Hoists can be deployed as Double Lifting Gear: working in parallel as for example in BOP handling systems or working in tandem connected by a coupling rod as for example for handling grinding rollers in the cement industry. Classifications: Ex II 2 GD IIA T4(X) / II 3 GD IIB T4(X) - Higher Classifications on request. Classification: Ex II 2 GD IIA T4(X) / II 3 GD IIB T4(X) - Higher Classifications on request. Classification: Ex II 2 GD IIA T4(X) / II 3 GD IIB T4(X) - Higher classification on request. 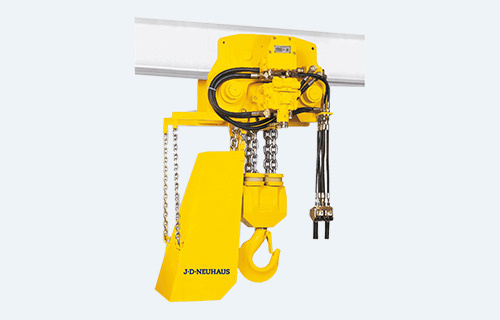 With immediate effect we can supply you with JDN Hydraulic Hoists with carrying capacities up to 50 t.
Depending of motor size the hoists work with an intake pressure of 100 bar up to 180 bar. Pressure fluid: Oil. 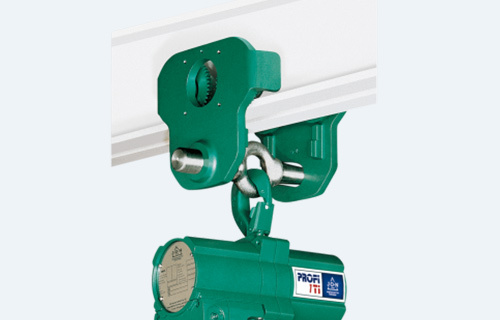 With immediate effect we can supply you with JDN Hydraulic Monorail Hoists with carrying capacities up to 50 t.
Depending of motor size the monorail hoists work with an intake pressure of 100 bar up to 180 bar. Pressure fluid: Oil. 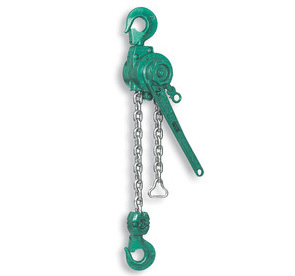 The WITT serves for lifting, pulling, tensioning or anchoring operations under all working positions. It has a robust cast iron housing and is extremely resistant against external influences. Technically the WITT distinguishes itself by a totally enclosed planetary gear. All rotating parts have ball, needle or slide bearings. 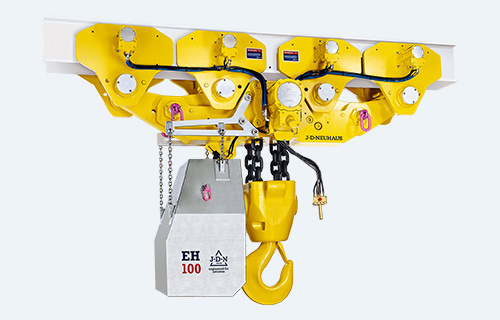 You would like to learn more about the JDN Hoists PROFI for subsea applications? Then download the leaflet “W 326”. For a special application at temperatures of minus 45°C, as e.g. 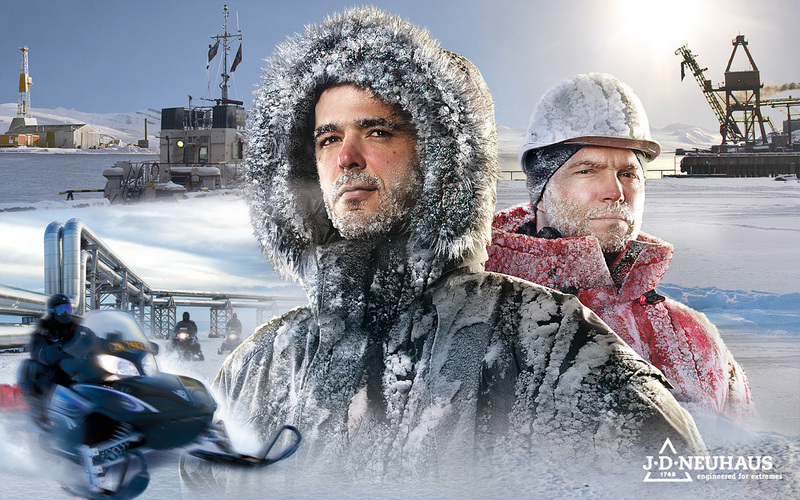 the BOP Handling in arctic zones, JDN has developed Hydraulic Monorail Hoists, which meet this demands. To achieve smooth starting of the Hydraulic Monorail Hoists at these extreme temperatures, they are fitted with a preheating device which increases the temperature of the drives to -25°C before operation by means of the standard hydraulic supply. Maximum operating safety results in ensured productivity: That's our promise for your JDN products and systems. As a J.D. 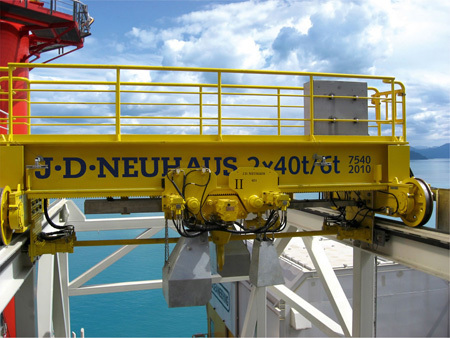 Neuhaus hoist or crane system operator, you know thanks to your own experience that our products are exemplary when it comes to reliability and longevity. SECURE YOUR PRODUCTIVITY, MAXIMISE YOUR OPERATING SAFETY! Is it possible to increase the profitability of an investment and simultaneously reduce the risk of production downtime? Yes, it is! By carefully planning ahead. 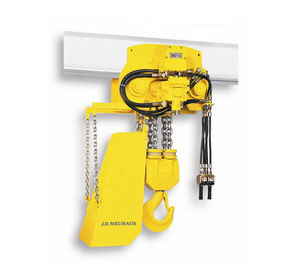 With JDN Service at your side, you ensure the continuous operational availability of your JDN hoists. And: With regular maintenance, you simultaneously ensure the maximum longevity of your JDN products. Long downtimes and a lack of operational safety of a system are absolutely the worst case scenario for every conscientious manager. Your best defence in this case is a service partnership with J.D. Neuhaus, since nobody knows JDN products better than their designer and manufacturer, which means us. Nobody can supply you with original spare parts or replacement products quicker and cheaper than we can. So what does it mean to you to purchase products and services from a single provider, the world's market leader in pneumatic and hydraulic hoists? This means one less thing to worry about. We manage your JDN products during their entire life cycle, we are certified according to ISO 9001 and ISO 14001, and we are a master of every export routine. That's quality of service that takes away your fears and helps you relax. What if something happens? You can contact JDN Global Service to help you every day, around the clock with experienced JDN technicians, who have the best training and operate around the world. We diagnose, find a solution, and fix the problem. In any remote corner of the world. We're JDN Global Service. We're prepared for extremes.